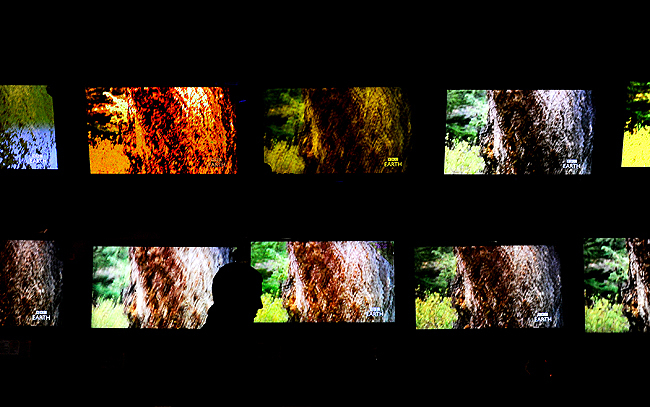 "A shopper walks by sale priced televisions during Black Friday at Best Buy in Orem, Friday, Nov. 26, 2010." Black Friday makes me nauseous. There really is no amount of money I could potentially save that would make it worth my wild. I could think of more ways to spend my money and better ways to spend the time people waste waiting for bargains. Things in Orem were tame on Friday. I don't know why, but I always feel like Black Friday will be way more exciting - pushing, kicking, fighting, all the fun stuff. Maybe it's the fact that I am usually running on a couple hours of sleep, or that it's four in the morning or that everyone else is in zombie mode like myself. Who knows. Either way, I got the classic frantic grab and go pictures, but my graphic eye liked the above. With that, Black Friday photos to me are like soccer goal remote images. I see a lot of them, rarely do I see one that's "smack in the face" memorable - including my own. I did some good features across the web, but nothing short of typical. Please feel free to enlighten me if you or a peer got something that will knock my socks off. "Chicago State's Carl Montgomery (21) gestures toward the hoop after drawing a foul against Brigham Young in the first halk in an NCAA basketball game at the Marriott Center, Saturday, Nov. 20, 2010, in Provo, Utah. BYU won 109-60." I have been really looking forward to shooting some sports since being back. Luckily my week ended shooting one of the two BYU blowouts. 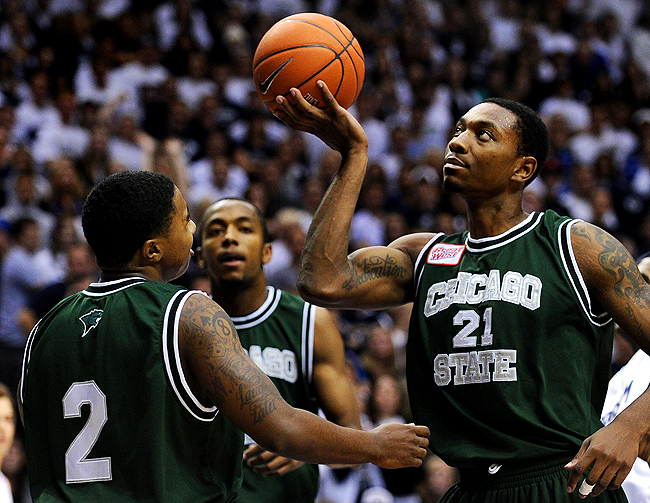 But to my dismay, the game was way out of reach for Chicago State and nothing exciting. Minus the Jimmer Fredette dunk, nothing beyond typical action happened. Since deadline was early, I shot three quarters of the first half, transmitted, ate some pizza, and then returned to the court. After a couple minutes of making some safe rectangles, I began to play around with shutter speeds and lenses. Still, nothing was coming out as I hoped. So at the end of the game, this quirky moment made my night. 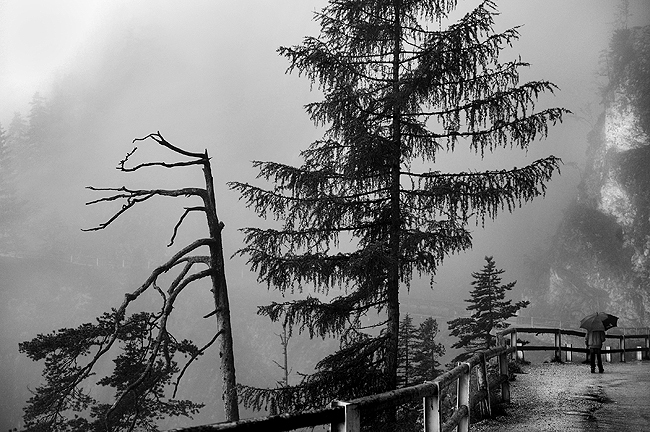 "A man bears the cold rain and snow as he hikes to the Eisriesenwelt Werfen Ice Cave in the Salzburg Alps in Austria, June 28, 2009. The Eisriesenwelt Werfen Ice Cave is the largest ice cave in the world." After a painful, long two months on the injured reserved, I am back in Utah and back at it. Hopefully the blog will return to its previous state of multiple, fresh posts a week. Feels good to be back. Stay tuned. Here is to a successful, fun and healthy remainder of the year. 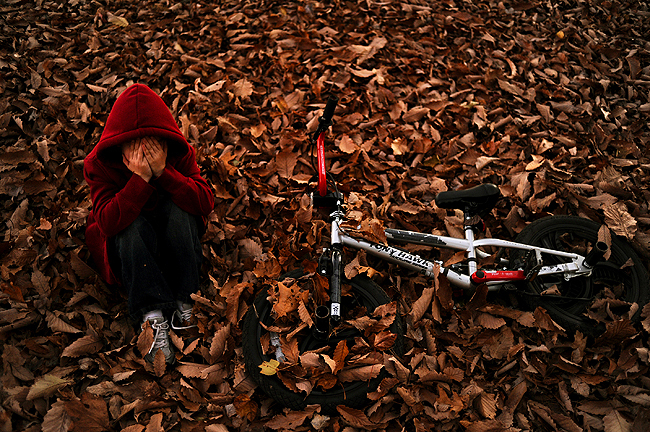 "Nicholas Neville, 7, shields his face in an act of embarrassment from the camera before rapidly changing his mind, as he plays in leaves in Whiteford, Md., Tuesday, Nov. 9, 2010." I've been trying to meet up with friend's and family before heading back to Utah on Monday. Yesterday was no exception as I ventured up north to K's sister's house for dinner. I was early, so I spent 20 minutes hanging out with her nephew, Nicholas, who at the time was playing in the leaves with his bike. It's funny how a seven-year-old's personality can change in a heartbeat. The minute I walked up he wanted nothing to do with me making pictures of him. But almost instantly, he was all about posing and acting goofy. He wanted nothing more than to be showered by the attention of my lens. 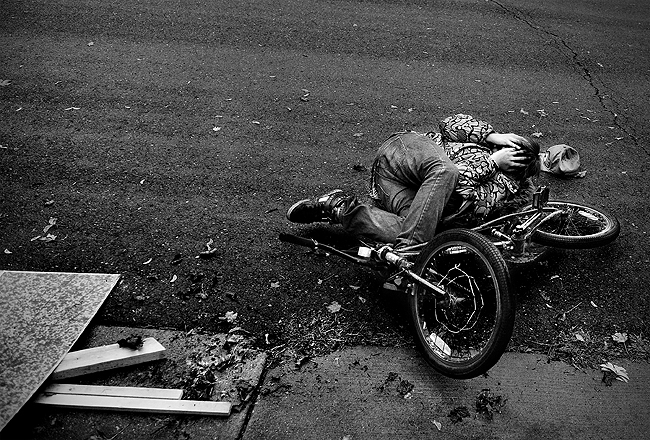 During editing of the take, the above picture reminded me of an image I took last year of a kid a moment after he crashed his bicycle. It's almost scary how familiar these two pictures are. The above being a reaction to my camera - shielding of the face in act of embarrassment - while the latter was another spontaneous moment where pain following a crash was the focus of the picture. The two pictures got me thinking about our presence as photographers during assignments. Obviously the above was a reaction to my presence, which I guess you can say, I influenced the reaction. But for the latter, would the kid have continued to jump his bike if I wasn't there? What if I wasn't shooting pictures at the time, would he had landed it? Would he have covered his face during the crash if I wasn't there? At what point do we change what happens simply by being there as a documenter of the scene? As my friend Monica said, we are apart of these moments, but have some say in how much we are, our approach and actions can dictate that. And when we feel the action has been done solely for our sake in an image, then it's left on the cutting room floor. It's something to think about. There are many variables and the topic can be discussed to no end in my opinion. In the meantime, we as photojournalists continue uphold strong ethics and continually police ourselves. But that shouldn't stop us from still taking pictures of moments that happen, whether they're publishable or not in the newspaper world. 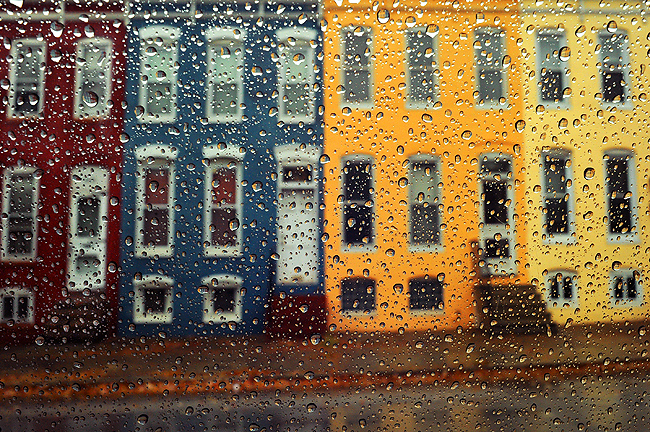 "A rainy afternoon in the Hampden neighborhood of Baltimore City, Md., Thursday, Nov. 4, 2010." The return to Utah has finally been set and I cannot be more ecstatic. I am feeling better (knocks on wood) and my flight is booked (empties wallet). I have less than 10 days in Baltimore before I head back to work, which I am eager to return to. I have been at physical therapy all week and continue all next week, too. So after my morning sessions, now that I am free to be mobile and drive (read: be normal and pain free), I have been trying to soak up as much as home as possible considering most all of my time was spent laying on a couch. The other day I had lunch with my buddy Matt Roth and then drove around the neighborhood. This picture speaks volumes about the city if you've never been - row houses are a icon. I have always wanted a bright, colorful row house in Hampden. I don't know why, but maybe one day I will if I ever decide to call Maryland home again. Why? Because we all know the saying on all the park benches downtown: "Baltimore - The Greatest City in America"